Iron Goddess King tea is handharvested from the highest mountain of Anxi County, Fujian province. It represents the best of the most popular of Chinese oolong tea. For green tea drinkers of China and Japan, this oolong tea has a magical allure. They are well known for their fat-burning and weight loss properties, but this is not the reason for its enduring popularity. What's so captivating is the mesmerizing floral, so powerfully relaxing that a few of my customers simply described it as being "heavenly to the senses". This unique aroma - called Yinyun - is well researched by the Chinese scientists. They discovered that the tea plant's succulent leaves contain the highest level of aroma oils, especially at low to medium temperature. The best tea resides at the highest mountain of Anxi County, at an altitude of 1,500 meters and above. In China, they are known as the Tieguanyin Wang, or the King of Iron Goddess. For many tea lovers, this oolong tea is indeed "god-sent". This natural orchid aroma - unscented and unflavored - is high durable - lasting 5 to 9 infusions. You can literally get intoxicated after a few cups. 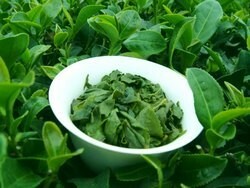 However, few in Chinese or Westerners have tasted the real Tieguanyin Wang. That's why we are excited when Shen - our personal friend in China - has agreed to reserve his highest quality teas for us. There are three reasons why we think Shen's oolong tea represents the best of Iron Goddess King. Between 1996 to 1999, a team of Japanese scientists traveled to China to select a tea garden for import into Japan's health conscious society. They took specimens of soils and tea leaves for chemical testing. After three years, they concluded that Shen's oolong teas contain the highest nutrition in Anxi county, the birthplace of this magnificent tea. The latest being the gold and silver medals won in 2008 Shenyang Tea Exposition Fair. Because we live in the same city and are friends, we are confident that you have access to his highest quality tea. Our customers are telling us the same thing: this is the King - the real Tieguanyin Wang - and nothing less. This is little understood by outsiders. Shen's tea plants are aged 4 to 6 years - the optimal age for producing nutrition rich tea. All teas are handharvested at an altitude of 1,500 metes and above. We only sell the autumn harvest, which has the highest aroma. In this tea shop, you will find six varieties of Iron Goddess King tea, representing the Four Styles that currently exist for this most popular of Chinese oolong tea. It showcases the staggering skills of the Anxi tea makers, right at the cutting edge. Tea tasting is a relative experience - you learn by comparing and contrasting. The most cost effective way to do this is to start from the lowest grade, and work your way up. The Sampler package below will introduce the five varieties from Shen's tea garden. They will expose your senses to the full range of flavors, training your palate to understand the subtle differences between each grade. This is the place to start. It contains three fragrant and two roasted oolongs. Click on the links below to learn more about each type of tea. Wow...a rating out of 5...well, I am thinking that compared to the stuff I've had in the past, I would say a 5, but this may not leave room for the higher grade teas. Well, I have to be honest that this is the first time I have ever tried good quality green tea. Usually I buy the grocery store stuff or from Starbucks (and restaurant green tea). So far, I have only tried the Aged AA and AA Amber Tieguanyin Wang teas. I have managed to get several infusions out of each and I have to say that so far, I am enjoying it immensely. There is no bitter taste and I find myself looking forward to making a pot every day. In terms of value, again, having never used quality teas before, I cannot compare the prices. It is certainly more expensive than purchasing at the store, but I am feeling that I would like to continue to purchase this tea, as I know the health benefits from drinking the quality teas and I am certainly enjoying them. The Tieguanyin Wang grade Yunxiang (King 4) is almost incredibly fine: the fragrance of summer meadows in blossom with a hint of fines herbes underlined by the exquisite light and nuanced bitterness that once again reminds me of high class sauternes; and it lasts! The Qingsuan (King 2) has a beautiful green-golden colour and on the nose a buttery sweetness combined with light flowery aromas; the taste has much the same character, to which is added a discrete acidity, with hints of elegant grapefruit bitterness in the aftertaste. I would rate it 5+. The Zhengwei (King 1) is another story, much more masculine in its attack â€“ the fragrance reminding my co-taster of a kind of small green lemon, the leaves of which are used, but not the fruit. The taste has a pungent toughness in its herbal notes with sharp edges and a pleasantly surprising dryness. It is a tea that will accompany food well, I guess. I would rate it 5. Truly the best yet. Being kind of eager to make me some Iron Goddess tea, I took one bag of the highest grade, and made about 7 infusions of that bag. What a scent!!! Ah, just marvelous. The cup was full of leaves. Not much space for the water :-))) And I used a large cup! Will use less leaves from now on. I am already a big fan of Anji and Baihao Yinzen and have commented on each before, especially the meditative effects of former and superb taste of the latter. The big surprise for me this year is the King and Jipin grades of Iron Goddess -- possibly the most flavorful and beautifully unfolding oolong leaves I have ever experienced. If this oolong were less expensive or I wealthy, I would drink it more than just on special occasions. It's worth every penny, however, and I am -- as with ALL your teas -- introduced to an entirely new level of quality, even though I have brewed and enjoyed loose leaf teas of high quality for many years. Thank you for your enthusiasm, knowledge, and the gift to the rest of us in making these teas available. My regular oolongs have been â€œMonkey Pickedâ€� at $25 per 2oz, or â€œTung Tingâ€� at around $15 from the US. Also a â€œWen Shan Bao Zhongâ€� (Â£23.50 per 100gm) and a â€œLucky Life Fu Soâ€� from here in the UK. The Tieguanyin Wang beats all of them with ease. Iâ€™ve had the King 2 and 3, but until I start doing the simultaneous tasting, Iâ€™d be hard pressed to give you an honest comparison between them. OK, theyâ€™re delicate and floral like most oolongs. However also one of the most sensuous drinks Iâ€™ve had, refreshing, with a fullness where there needs to be. Nothing missing, no disappointment. Beautiful. I can honestly say that it was one of the nicest cups of tea Iâ€™ve ever had â€“ and I drink copious amounts of high-grade tea. Practical tips about how to store and brew this tea can be found at the links below. Anxi Tieguanyin tea is one of China's 10 famous teas. 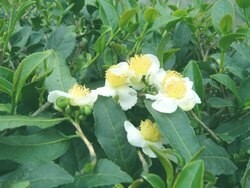 It is so popular in some countries that it is synonymous with oolong tea. These reviews have been collected from customers emails and published with their permissions. I read somewhere online that this tea today is not produced as before. Tieguanyin Oolong Tea - Shen's Double Wins Breaking news! 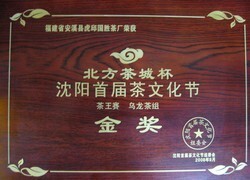 Shen's Silver Medallist Tieguanyin oolong tea won medals for the second consecutive time this year.